It could be argued that on that fateful day in 1963 when sitting president John F. Kennedy was assassinated the nation lost its naiveté. It was on that afternoon that modern conspiracy theory was born, and for the last 50 years the nation has hotly debated the root cause of his death. Some would argue the mafia did it, or maybe Cubans? There is also the looming specter of a group of disaffected CIA operatives carrying out a sanctioned hit. Sanctioned by none other then Lyndon Johnson. Many people have been implicated in the assassination, but the actual purpose of his killing has still remained elusive, even after all this time. It will probably always elude the conspiracy practice born around that dark day. Maybe it was Johnson’s lust for the Presidency, but conspiracies are never clean and simple and that seems too easy. For my money I would imagine that the assassination was carried out for a lot of reasons, and I think E. Howard Hunt’s death bed confession gave the public a window into the actual event but I also suspect that there are other contributing factors beyond simple greed and envy. Although greed and envy, as mortal sins, have driven many people to do desperate things and an assassination would fall into that category. It could also have been a single lone nut, but given the events after the act I would posit that as being unlikely. One interesting thing of note, and I suspect a strong candidate for contributing factor is a fairly recently uncovered document Kennedy sent a few days before the Dallas trip to the Director of Central Intelligence regarding not only UFO’s but also the opening of a dialogue with the then Soviet Union for joint lunar and space exploration and possibly even more. 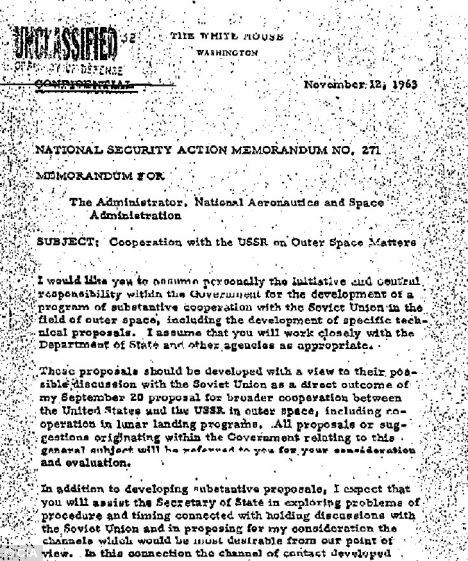 In the document Kennedy discusses the fact that he had tasked James Webb, the administrator of NASA, to develop joint operations with the Soviet Union. He asks the Director to evaluate “High Threat” cases to confirm they are “bonified” vs classified USAF or CIA operations. He also points out that it is important to make a distinction “knowns and unknowns” so the Soviets would not mistake our seeking a joint space program as an intelligence cover. It is that last line which got me to start thinking. Since I was small I, like many, was always lead to believe that NASA was a civilian space organization. The fact that many of the astronauts were military was ostensively related to their advanced flight training vs. the idea that they were indeed military personnel being placed into orbit. Only later did we find out that NASA was indeed being weaponized. The interesting part of this is Kennedy’s choice of words. In no way does he refer to these objects as UFO’s, instead opts for the characterization of unknowns which carries the implicate that they may or may not be extraterrestrial in origin. It does carry the implication that “unknowns” were a known factor. 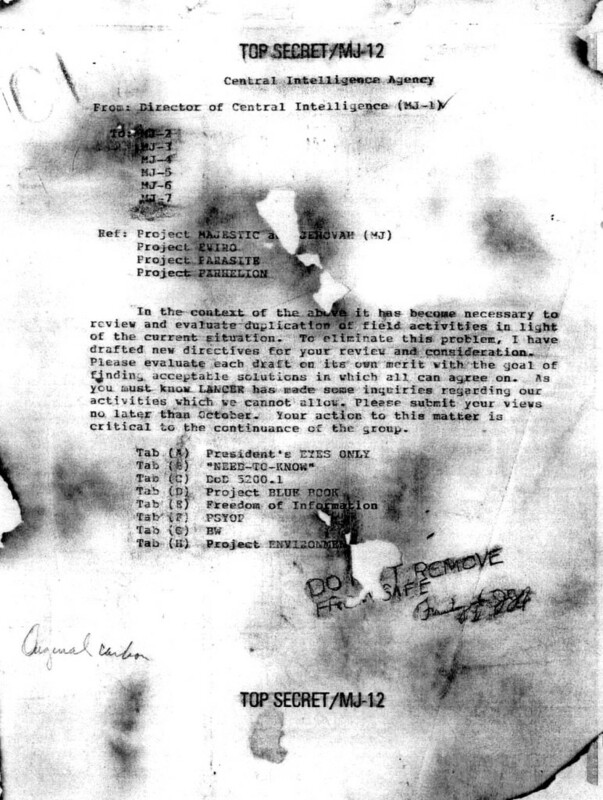 Additionally there emerged a memo, referred to as “The Burned Memo,” released to Timothy Good which seems to indicate the ever present Majestic 12/MJ-12 cabal wanted to suppress Kennedy’s investigation into “unknowns” and the memo seeks to find acceptable means to deal with the issue. 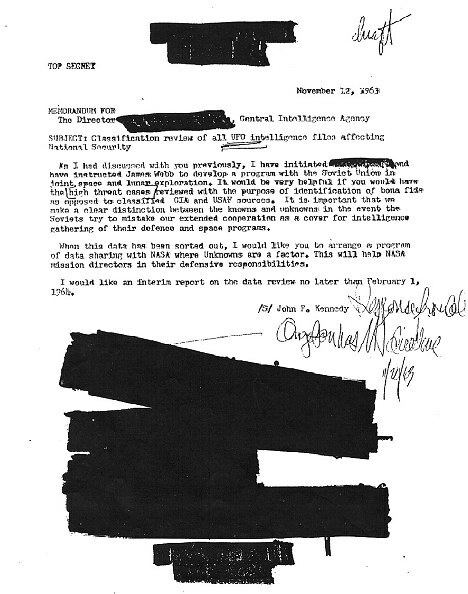 It should be pointed out that the burned memo is highly controversial but Majestic 12 research Ryan Wood swears by its authenticity, but at the same time it is consistent with later requests by Bill Clinton into Roswell and UFO’s where he was reportedly told that he shouldn’t chase the issue any further. What happened to Clinton, and the subsequent restatement by Jimmy Carter of his UFO sighting, he now downplays it as a aircraft, seems to demonstrate a level of fear in both of these men. You might say they were “gotten to” in some way, which could have included a threat. In Kennedy’s case, probably because he was unpopular in certain cirlces, the acceptable means requested by the MJ-12 group may have included a suggestion to the right people (Johnson?) that Kennedy be assassinated. So what is the real story here? Was someone or some group afraid of allowing Kennedy access to information about aliens? That is probably unlikely I would suspect. We can look towards some of Kennedy’s decisions to demonstrate that he was not opposed to covert operations, and with the release of the Kennedy tapes the public was invited into the oval office as John and Bobby Kennedy debated with Colby (head of the CIA at the time) supporting a coup against President Diem of South Vietnam. 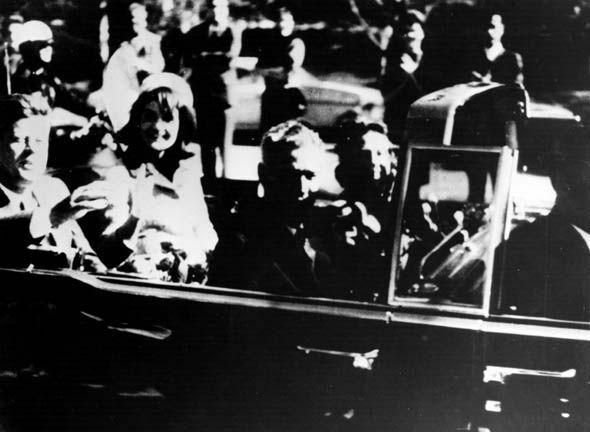 During those conversation a very cold and calculated John F. Kennedy weighed his options, a conversation which eventually lead to Diem’s assassination. What makes more sense is that if, in releasing that information, he came across a conspiracy so vast that its implications could be nation or world shattering. In this case the guardians of that information would do, and have done, whatever is necessary to protect their project. Not only because the information is dangerous but also because of the countless laws they have broken, and people they have murdered to keep the secret. Kennedy found the secret, and the wheels of conspiracy emerged from their cloaked cover to start the ball in motion. So what would be so earth shattering? How about a war in space?! From previous research it is known that starting in the 1950’s plans were being drawn up for the militarization of space. Projects like the MOL (Manned Observation Laboratory), as well as advanced research projects into particle weapons and lasers had begun well before Kennedy had taken office. Names like Chair Heritage, Saipapu, and See-Saw had their starts before the Kennedy administration had even begun. In fact Project Lunex, the USAF moon base, was proposed to be fully operational by 1961, which is two years before Kennedy was assassinated. The question is – Were those programs to fight an eventual war in space against the Soviets or were they designed and deployed to fight someone else? The answer to that question lies in the final paragraph where Kennedy refers to the defensive responsibilities of NASA. It could be surmised that Kennedy was aware that the US military was leveraging NASA capabilities to deploy these missions and systems into space or at least at some level NASA was aware of the projects and missions. Based on this I think that while some of these projects were indeed, on the surface, designed to fight the Soviets in a World War III scenario the true nature of these projects was more defensive in orientation against an internal aggressor. The problem was that from all accounts Kennedy wanted to make projects with the Soviets more transparent, that coupled with his known ability to get answers probably made him a very dangerous person. It was probably quite threatening to the powers that be. You might think of the proposed space war as the ultimate dirty war. If it were to become confirmed and public it would lead to mass panic most likely. People were fear armed saucers descending from the sky, and have visions of a powerless US military crumbling under the onslaught of some advanced non-earth force. That kind of revelation would also expose the level of technical advanced the military has made through the years which would also breed distrust. Conservative estimates place the DARPA programs hidden in Special Access Programs 60 to 100 years in advance of consumer grade technology. High speed subterranean bullet trains, like the recent proposal by Elon Musk, would pale in comparison to the project proposed in 1972 by RAND to build a coast to coast bullet train not traveling at a mere 500mph but closer to 14,000mph and able to go coast to coast in 40 minutes. Kennedy’s knowledge of these projects would have presented a danger, and as stated previously, his ability to dig for answers would have made him a threat. In 1963 Kennedy carried considerable political power, and that made him a target. It’s also important to remember when considering this that at the end of the day it doesn’t really matter if the threat, which Kennedy referred to as “high threat cases” is extraterrestrial or of extraterrestrial human origin. What is more important is that these “unknowns” represented a considerable threat at all. That statement implies actions were being taken to mitigate the threat, and that is the genesis of the problem. To expose those technologies and projects existence would not only destabilize the country but also threatening the people running that and as the MJ-12 memo said – that was unacceptable. So did MJ-12 carry out the hit? No I suspect not. That really is not how an organization, parallel shadow government per say, functions. To organize and assassination and carry it out would probably generate undue scrutiny, or potential scrutiny, on their operations. What is more likely is that recognizing the threat Kennedy posed they would start to make suggestions and pressure the right people at the right time to do the dirty work for them. It’s all about plausible deniability, and someone like Oswald recruited by a group of disaffected CIA operatives like Frank Sturges or E. Howard Hunt to be the fall guy makes more sense. Upstream Sturges or Hunt recruited, and convinced by Johnson operatives and given a passive sanction makes for the perfect storm. A storm ended when Oswald the killed, in police custody by Jack Ruby. The assassination of Oswald ended the link, and that is how subversive covert actions operate. Oswald got caught, and Oswald was killed to protect the system which had placed him into that position. Simply put Kennedy was killed for protection. Protection of information, protection of secret projects and it is how things work. I think Eisenhower said it best in his farewell speech in 1960, a farewell speech he gave as he stepped aside to Kennedy. It was with those words that Dwight D. Eisenhower ceded power and the presidency to John F. Kennedy, and it was three short years later that the same military-industrial complex facilitated what happen on that day 50 years ago in Dallas. So was Kennedy assassinated for his interest in UFOs? Probably not. At the end of the day Kennedy was assassinated because he made the wrong people angry, angry about a lot of things including his interest in “unknowns.” That anger breed support for a coup d’etat, and that coup d’etat forever changed our nation and the secrets were safe once more.